I took a huge load of kitchen goods to the thrift store on Friday. I’m trying to get rid of as much stuff as humanly possible before the kitchen is put back together; I don’t want to put anything back in those cupboards that doesn’t absolutely need to be there. Which is great in theory, except that I can’t just drop a load off at Savers without going inside, looking around, and coming out with one. But I got some really cool stuff! And I came out with less than I went in with, that’s got to count for something, right? Right? Anyone? Sigh. Oh, Allison. 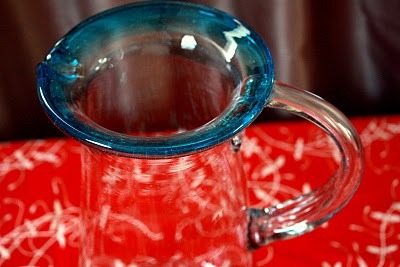 I wavered and wavered, and wavered about this glass pitcher. And when it came down to it I stood at the check out counter for a good 10 minutes deliberating and negotiating with the cashier. It was $8, which seemed ridiculous to me. What’s really ridiculous is that I didn’t think twice about going next door immediately afterwords and buying a chicken salad from Cafe Rio for $8.50. << my boyfriend’s outta town. I know, thrifting pricing seems so arbitrary. I used to have that pitcher and a bunch of matching glasses but it's in my parents' poolhouse now. I found it a bit ungainly when full- hold from the bottom and the handle while pouring or the handle could crack. 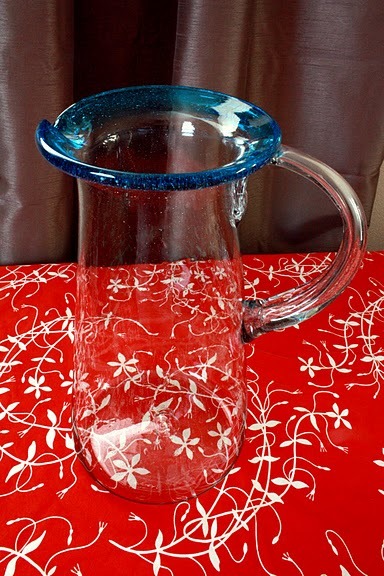 The pitcher should have been about $5, but in stores you would pay anywhere from $15 to $20 unless it came from Mexico. I wouldn't think twice about getting Cafe Rio either. I love it! 8 bucks is high, but sometimes if you snooze you lose. That is a killer pitcher! I think I would have bought that for $8! Good find! We need to go again! So, did you talk 'em down? Sometimes I wonder how much authority those checkers at Savers really have. I had a good haul there recently, but I forgot my coupon (d'oh) so it wasn't as good as it could have been. Still good though. GOOD LUCK WITH THAT KITCHEN! It will be worth it. Really. anything that can hold that kind of volume of margaritas is worth $8 in my book. you did good. But the Cafe Rio salad is SOOOO worth it! So true. I just can't stand to spend $6 on a sweater at a thrift store but I'll spend $4 on a cup of coffee at Starbucks?? Heh. The pitcher really is gorgeous, though. You are so our father's daughter.